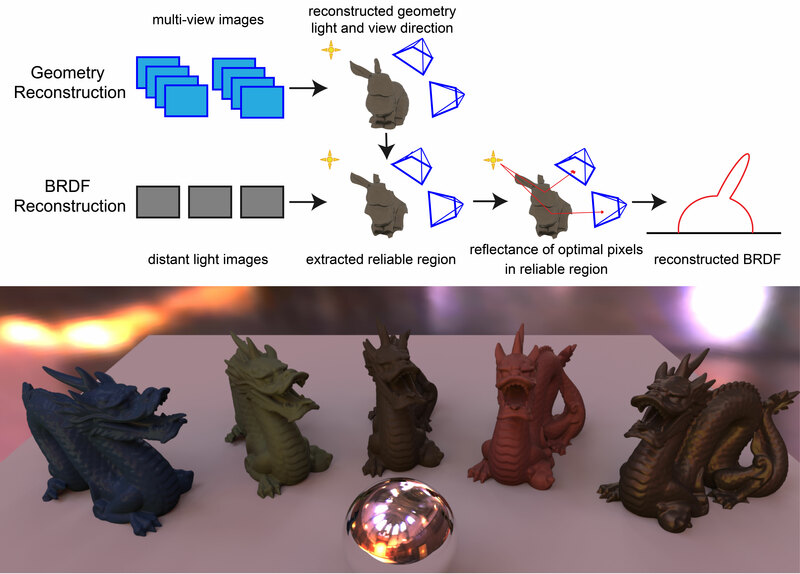 In this paper, we present an effective approach to reconstruct the bidirectional reflectance distribution function (BRDF) from a real object without any special devices and complex setups. Multi-view images are commonly used to reconstruct the three-dimensional (3D) shape of an object, and this is known as photogrammetry. For the purpose of photo-realistic rendering of an object, our approach is practical because it is highly integrated into the photogrammetry pipeline. Our method requires to acquire multi-view images for 3D reconstruction and a few additional images to obtain the reflectance distribution. We use the reconstructed geometry from multi-view images to determine the region of optimal light and view directions according to the existing analytic methods. However, the reconstructed geometry and surface normal tend to contain artifacts. Therefore, we introduced assumptions that are the main contribution of our study to extract the reliable regions from the reconstructed geometry. The results demonstrate that our method effectively acquires a plausible BRDF.